Long before Christianity took hold in Galicia, the area around Monforte was inhabited by the Celts, known for their skills in mining and metalwork. For defense, they established encampments on top of the hills. Monforte was such an encampment, one of the most influential Celtic settlement in Galicia. The Benedictine monastery was built on the site of this Celtic fort and was modified over the years. The Lords of Lemos constructed a palace next to the monastery that was used more as an agricultural storage facility than as a noble residence. The 10th Lord of Lemos, Don Pedro Antonio Fernández de Castro, in order to attract the notice of the king of Spain, transformed the “palace” into a sumptuous estate with exotic gardens and an animal park. The king named him to the position of Viceroy of Peru, but the count subsequently went bankrupt from his extravagant spending on Monforte. Apart from the Spanish, you’ll see very few tourists in this corner of Galicia. The main attraction here, of course, is the monastery/parador; however, the town is pleasant enough to walk around in, and a tourist office will help point you in the right direction. Festivals, which are open to all are held throughout the year. 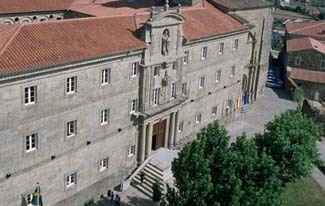 Monforte de Lemos is 60 km south of Lugo. From the A-6 highway, take N-120 and go west towards Ourense. The parador is signposted. The monumental San Vicente de Pino monastery complex sits on the highest point of the town of Monforte de Lemos. Part of this huge complex, combined with the Condes de Lemos palace is where you’ll find the parador. Guest rooms are in the monastery and function rooms are in the palace. To the left of the main building a castellated medieval tower/keep may be climbed for a small fee. The focal point of the monastery is a neo-classical, three-story-high, stone cloister. In the center an ancient cistern used to store rain water collected from the curved channels in the flooring. In keeping with the buildings origins, sacred choral music is often played softly in the background. Guest rooms are situated around the cloister. Elegant furnishings are offset by whitewashed walls, terra cotta floors, and velvet drapes. Bathrooms are large and modernized. Enjoy Galician specialties in the formal restaurant, with its high-backed velvet chairs under a wood-beamed ceiling. A café offers lighter fare such as sandwiches and tapas. On occasion, special medieval dinners with entertainment are offered.